More celebrities are opening up about their personal battles with mental health issues, and Mark Wahlberg is one of them. The 47-year-old actor recently revealed to an audience at the annual LEAP Foundation conference that an arm injury altered his daily routine in a way that ultimately led him to a dark place. “When I was down and wasn’t able to do the things I’m used to doing, I started to feel depressed — and I never feel depressed,” he said, according to The Hollywood Reporter. While he didn’t expand on the experience, he did reveal that it was the motivation “instilled” in him that helped him get to the other side. Wahlberg also shared with the crowd of about 500 high school and college students that his mantra is to work twice as hard as anyone else, and he refuses to lose the drive to keep going — both qualities he believes helped him get to where he is professionally. It’s having that ‘ marathon’ over ‘sprint’ attitude,” he said. Wahlberg isn’t the only male celebrity to get vulnerable about their mental health. Despite the fact that 6 million American men suffer from depression each year, the pervasive “boys don’t cry” attitude has made it hard for men to open up about their struggles. However, in recent years everyone from Prince Harry to Dwayne “The Rock” Johnson have made boldly honest confessions. And we couldn’t be more grateful for them. After all, talking about depression is one of the best ways to lay the stigma to rest. 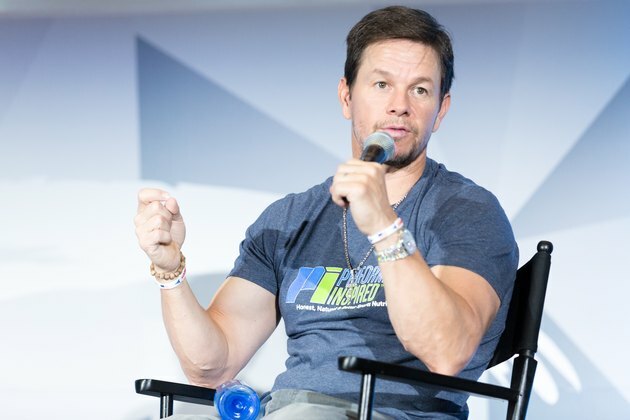 During his speech at the conference, Wahlberg delved into his daily physical, mental and spiritual practices that help him stay grounded, and let’s just say he definitely practices what he preaches about his hard work ethic. Breaking down his morning routine, the star revealed that he wakes up at 3:30 a.m. every day (ouch!) with a prayer, followed by a workout soon after. It’s very possible that falling out of his daily rituals, especially his workout regimen due to an injury, contributed to Wahlberg’s mental health issues. A 2018 review from JAMA Psychiatry found that strength training can reduce signs of depression. So when you stop suddenly, you may lose those depression-fighting benefits. But by all indications, Wahlberg is no longer sidelined by his previous injury. In February, he revealed he was in the process of dropping most of his body fat in preparation for the Peter Berg-directed thriller, “Mile 22,” hitting theaters August 17. More recently, he shared on Instagram that he was amping up his workouts to two-a-days in preparation for another role, which many of his followers speculate to be a sci-fi action movie, “The Six Million Dollar Man.” It doesn’t seem humanly possible he could get into better shape than he already is, but clearly he’s determined. And with all those added sweat sessions come mood-boosting endorphins. If you think you may be suffering from depression or another mental health condition, you should speak to your physician or other mental health expert. You can also check out the Substance Abuse and Mental Health Services Administration’s website to locate a local treatment service or call the agency’s referral hotline at 1-800-662-HELP (4357). And, like Wahlberg, don’t be afraid to open up the conversation about mental health. Are you surprised that Mark Wahlberg has experienced depression? Are famous men like Wahlberg and Dwayne “The Rock” Johnson’s confessions helping to remove the “boys don’t cry” stigma?